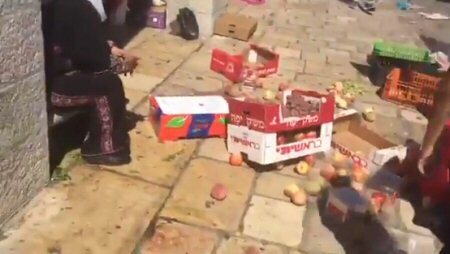 Israeli municipality staff have assaulted Palestinian farmers and vendors in the streets of occupied East Jerusalem on Monday, a day before the Muslim holiday of Eid al-Adha. Locals said, according to Ma’an, that Israeli municipality staff, under armed security by Israeli forces, targeted Palestinian farmers in the streets of the Old City of Jerusalem and in the Salah al-Din Street of the city. Meanwhile, Israeli forces assaulted an elderly Palestinian woman with several other farmers, and destroyed their crops, including grapes, apples and peaches.